A very, very fun day cycling up Col de Joux Plane and watching the Dauphiné. 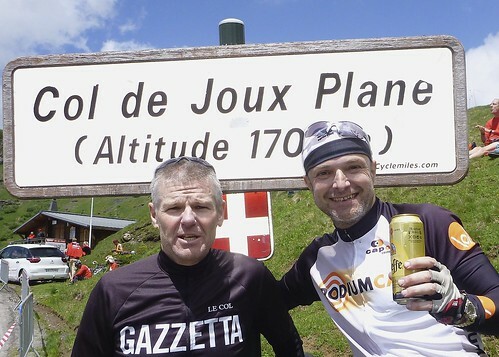 I even played domestique, carrying up a beer each for Dave and I. Dave cycled up the Morzine side, so I surprised him with his victory beverage as we met at the summit. If you are looking for maps and profiles to cycle Joux Plane: North Side from Morzine. More famous south side from Samoëns. I wish I was there also. Nice ride and nice pictures. Thank you for sharing. David Millar said he hit 110 km / descending Joux Plane ….. wow.